I have a rollercoaster of emotions that create weather patterns; tornadoes angrily flinging fence posts, hail storms of icy stares and clouds bursting with tears. Like so many, or every woman out there, I have mood swings. These wild oscillations do not describe who I am or make me unbearable but I cannot turn them off. In general my mood swings are controlled directly to my hormonal fluxes. I have a hormonal imbalance caused by lack of hormone production in my body. I was never aware that I could feel stable until I became pregnant with the twins. That first pregnancy produced extra hormones that made me feel complete for the first time in my life. When I was no longer pregnant or breast feeding my hormones returned to normal levels causing my mood fluctuations to grab hold even stronger. In hindsight it was most likely not any different than what I experienced before being pregnant but now I was aware of feeling elated. I was addicted, looking for my next hormonal high. When I would speak to my doctors about missing the way my brain thought and felt when I was pregnant they assumed that I was crashing due to baby blues or some other postpartum diagnosis. This in fact was not what was wrong with me and I was looking for a real answer. I went through prescription after prescription of different types of antidepressants to help stabilize my mood. It was not until I became pregnant again that I finally found that high I had been longing for. As with the first pregnancy once It was over the crazy came back. I decided to switch doctors and looked for a different approach. I found one willing to test my blood for everything. He discovered that I was not producing enough hormones on my own, most likely since puberty. I started a new medication and within weeks I was riding the high. I still have mood swings but now they only last hours versus week long battles of up and down and in and out. This has not changed much in my home life. Actually, it has made me a better mother and wife, but that was never in question to begin with. I had learned to control, push back, hide behind alcohol and depression so well that most people never knew the struggle. My husband always knew. Now I act fearlessly pushing aside the filters I so heavily relied on. 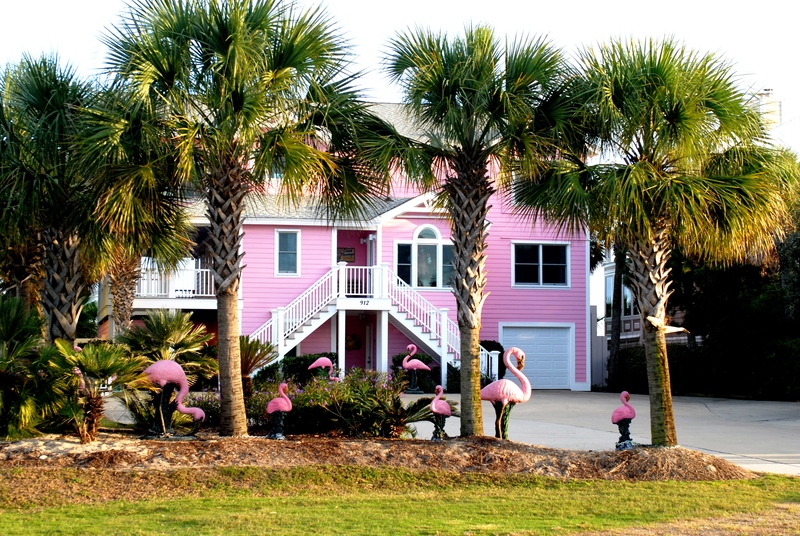 Crazy flamingo lady! I love those sassy mingos! When I first met my husband I was only 21. We had met at one of his frat parties. The only reason I went to this party was because my roommate dragged me off of World of Warcraft long enough to force me out into the world. I was also currently on a break from my boyfriend who kept me from parties but my roommates believed that I needed to meet new people. I reluctantly went to the party deciding to have fun with a mix matched crazy ensemble and mardigras beads that I threw on. I drank. I played cards. I found a small click in the corner who were talking about their World of Warcraft characters and fell right into the conversation. What I did not realize was that this little group of friends were actually my future husband’s best friends outside of the frat. We met for a minute and I went home. A couple nights later my roommates invited a couple frat guys over to our apartment and I was suppose to play the wing man. I was suppose to entertain my future husband’s best friend while my roommate tried to get something going on with my husband. At some point in the night I had excused myself to my room and moments later he was there. A kiss exchanged and that was that. It would be six months until I saw him again. During these six months I had gotten back together and broken up with my boyfriend three or four more times. I never understood what I was thinking playing the back and forth game. I had gone on a few dates with nothing really encouraging me other than the free food and change of scenery of campus. Then my phone rang. My future husband had heard that I was going to finish my semester over the summer. He also was staying and thought we could hang out. Two weeks after that phone call we moved in together and almost 10 years later we still live together. He knew instantly that I was a little crazy and I knew that I never had to hide the mood swings or place a wall between us. There was a comfort, an understanding, with a non judgemental person not trying to change me unless that is what I wanted. He learned how to cope with my emotions. I know that we are happier now that I am adjusted. I know that we were happy before but there is a power in truly understanding and finding your true self that is exhilerating. I want to stay this person forever.